The biggest and most talked about shot in the UAAP Season 77 Men's Basketball Final 4 happened yesterday in the do-or-die-winner-take-all match between the defending champs DLSU Green Archers and the 2nd seeded team FEU Tamaraws at the historic Smart-Araneta Coliseum. The game was a nip and tuck affair from the get go and for the pleasure of the thrill seekers and basketball fanatics, it came down to the last 24 seconds when the game was all tied at 64. Mike Tolomia was isolated from the top of the key and he made sure to waste some precious time, he ended up making a terrific read of DLSU's help defense as he saw Mac Belo open in the corner for the game winning 3-point shot that pushed FEU to victory via 67-64 at the final buzzer. 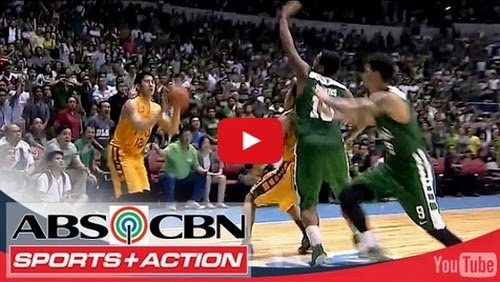 And so, the FEU Tamaraws are back in the the UAAP Finals to face the up and coming NU Bulldogs. Superhero Belo finished the tight match with 23 points and 8 rebounds.